Hotel Garni Hardenberg Berlin, Berlin discount hotels and accommodation. 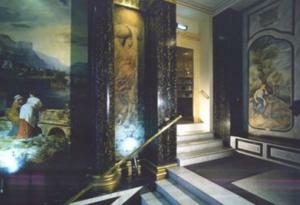 The Hotel Hardenberg Berlin is located right in the Berlin city center between Kurfürstendamm and the Memorial Church. Just a few steps away from the main railway station Berlin Zoologischer Garten. The Airport bus N° 109 from Tegel Airport stops in front of the Hotel. It is about the best starting point you can have whether you´re in Berlin on business or for pleasure. The hotel has 43 comfortable rooms offering both comfort and personal services in a warm and friendly atmosphere Our exquisitely designed breakfast room with its inimitable atmosphere gives the hotel a character of its own. Enjoy one of the best buffet breakfast to savour up to 11:00 h every day. View photos, room descriptions and make online reservations at Hotel Garni Hardenberg Berlin. Save on room prices at Hotel Garni Hardenberg Berlin, Berlin.